Rated PG-13 by the MPAA for language, drug use, and some suggestive content. Running time: 110 minutes. Released by Warner Bros. Pictures. 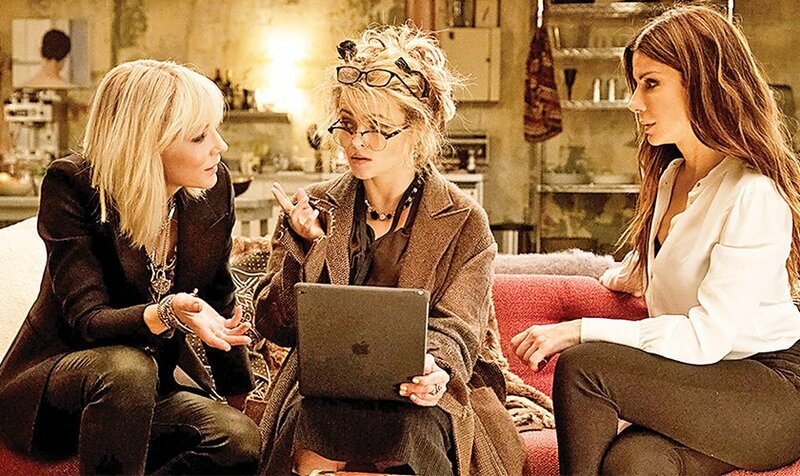 Reviewing Ocean’s Eight is a conundrum. Are we supposed to judge if it stands alongside Steven Soderbergh’s 2001-2007 trilogy which provides this film’s basis, or are we to take it as a different animal entirely? 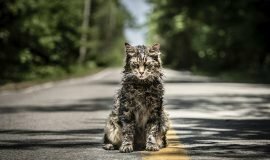 The tone which director Gary Ross wants to strike makes a case for the former, but the barely exciting, straightforward nature of the film lands it in different territory. 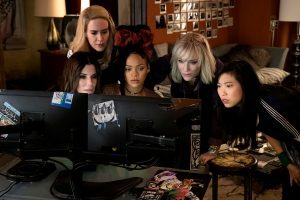 Ocean’s Eight is a sprite of a film, lifted by its effervescent cast and against-type performances. 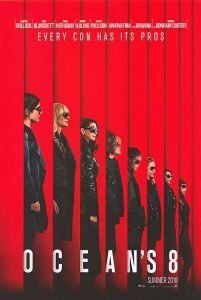 However, its bland direction by Ross and its neither-here-nor-there screenplay by Ross and Olivia Milch threaten to halt this film before it starts rolling, much less get to a point where it can hold its own in the Ocean’s series. Ross can surely ape the look of the series thanks to cinematographer Eigil Bryld’s engaging choices, but he doesn’t nail its heart and soul. 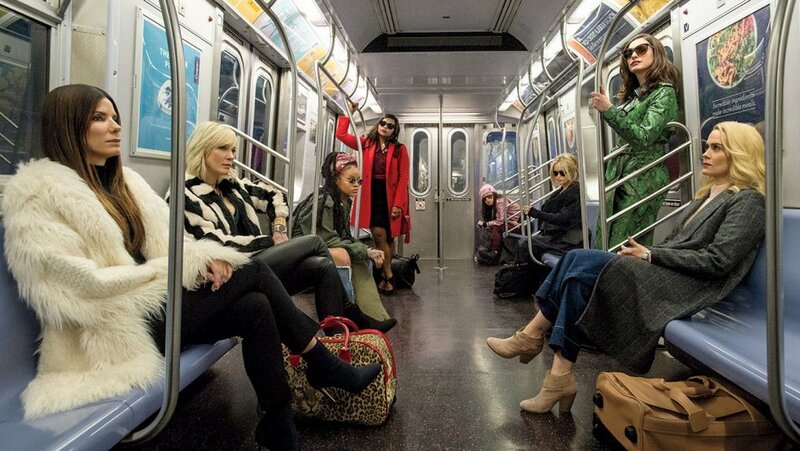 In attempting to make Ocean’s Eight stand out, Ross throws away every bit of frippery and drives straight to the point. There’s no mucking about with motivations, plots, subplots, or side-schemes. Almost every character doesn’t get the chance to shine or make things their own; it’s almost as if you can feel the cast and crew tiptoeing carefully around the set, trying not to set anyone off by being – God forbid – fun. We’re living in dangerous times when people slag movies on social media before they’re even made, and this movie spends its time walking on eggshells trying not to offend anyone. If Ross wanted to differentiate his installment from Soderbergh’s, he could’ve probably done without the almost line-for-line remake of Danny Ocean’s (George Clooney, not appearing in this film) opening scene from the first film. Debbie Ocean (Sandra Bullock) sits in the hot seat, saying whatever she needs to say to get an early release after being jailed for – yup, you guessed it – theft. It runs in the family, so now that she’s free, she’s about to pull off a major-league heist just after faking her way through her parole hearing. It’s this kind of overreliance on callbacks, visuals, and maybe a stray character or two from Soderbergh’s trilogy which start to mire Ocean’s Eight in its own mud. The humor seems forced and contrived, like someone’s supposed to say something funny instead of actually being funny. You can practically see the film with its arms outreached, tendons and muscles bared as it strives for the cleverness which Soderbergh so casually achieved merely by trying to do his own thing. Ross so desperately wants that vibe, using rapid zooms and cool jazz-driven tunes, but it winds up looking like a safe, Hollywood-controlled cash-in on something vital and immediate. This attempt is made clear by the under-written characters each actor is asked to flesh out and give life. Little is given of their personalities other than being laser-focused and committed to the job. 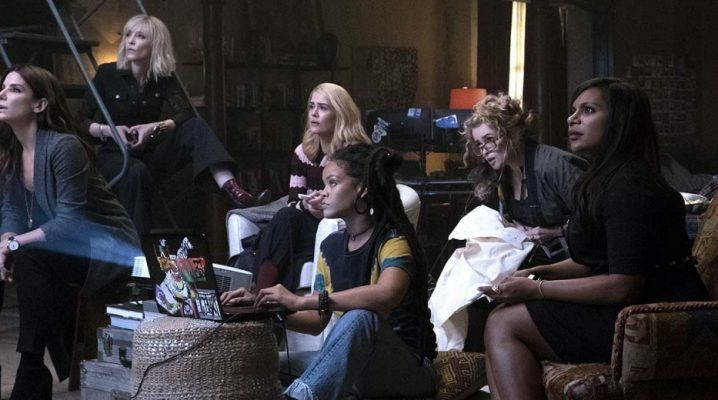 While stoner hacker Nine Ball (Rihanna), fleet-fingered thief Constance (Awkwafina), and henpecked jewelry expert Amita (Mindy Kaling) are certainly proficient at their tasks, we’re only given rote bits of humorous introductions before totally losing any attachment to them during and after the heist. The majority of the character development goes to the neurotic and twitchy Rose Weil (Helena Bonham Carter), a once-trendy fashion designer now fallen far out of favor with the fashion world. She’s not a criminal, and she’s way out of her league when Debbie and her “business” partner Lou (Cate Blanchett) come to recruit her. 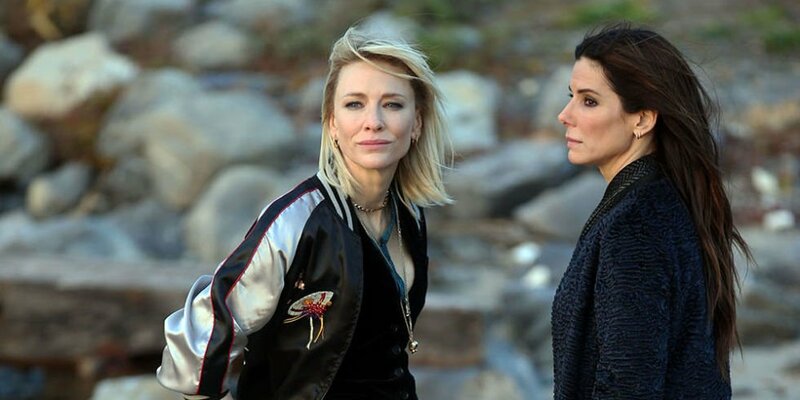 Bullock and Blanchett carry the film well, bouncing breezily off each other with their dialogue scenes. 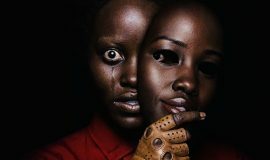 Yet they’re kept muzzled, not let off the chain; their dimmed personalities don’t add anything to the film other than setting up the motive behind the heist they’re organizing. We want them to let loose a bit. You can see the twinkles in their eyes throughout, like there’s more mischief afoot, but no – this is as business as business gets. This may be the magic trick Ross wants us to savor: having two high-power actresses step aside to let a new generation have its moment. Sarah Paulson takes this opportunity to carve out the memorable “suburban mom with a seriously shady side” role, combining her jobs as mom and hijacker for the big score. Another big name you’ll see on the posters belongs to Anne Hathaway, playing stereotypically self-obsessed actress Daphne Kluger, making big moves to stay in the public eye. Through nimble machinations on the gang’s part, Daphne hires Rose to create a dress for her appearance at the annual Met Gala, which also involves – surprising no one – a $150 million necklace on loan from Cartier. Hathaway is gregarious and stunning, perfect in so many ways for this part; she, more than Ocean’s crew, grabs our attention as she prattles on about what she wants and how she’s going to get it. In the film Rounders, Matt Damon (also seen in the Ocean’s trilogy) says: “We’re not playing together. But then again, we’re not playing against each other either. It’s like the Nature Channel. 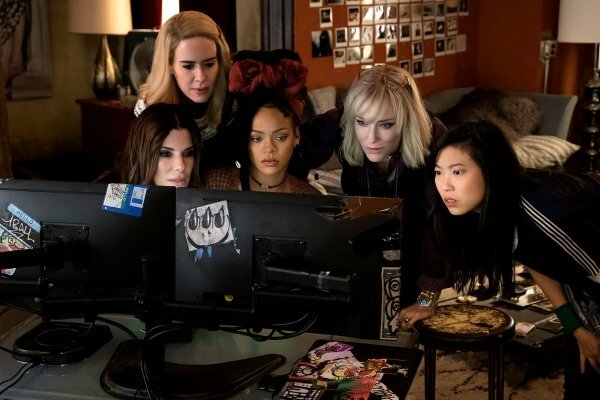 You don’t see piranhas eating each other, do you?” This is exactly the vibe of Ocean’s Eight; Ross doesn’t give a lot of time to camaraderie and hijinks. Let’s be frank: what you’re watching is a machine. 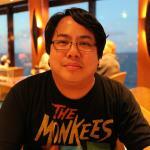 A good-looking and well-acted machine, but a machine nonetheless. The women don’t have to dash off one-liners in order to get the job done; they just up and do the thing with workmanlike precision and grace. Oddly enough, we don’t see any pitfalls or anything more than moderate adversity blocking their way – things fall into place for them like a key fitting the pin tumblers in a lock waiting to be opened. A film bearing the latter-day Ocean’s name is expected to be fast, loose, and subtly funny, with a dash of “will they pull this off?” to keep us in suspense. There’s no suspense here; these women are confident in themselves and their plan, and so are we. Not for one second would anyone worry about them getting caught; Ross doesn’t angle his film in that direction, keeping action and the derring-do to a minimum. Even the color palette is muted, with greys dominating this color-desaturated world until the Met Gala. Instead, it’s about making a case for Bullock and company to take over the reins from Clooney and his bunch. 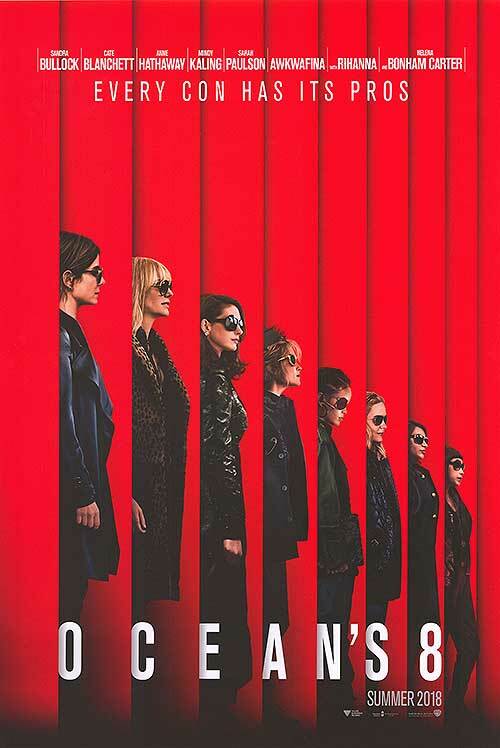 The film makes one unforgivable mistake toward the end – one which I will not spoil – which suddenly brings us back to the question: do we take Ocean’s Eight a film which stands beside its predecessors, or something completely different? Not enough work is done for the latter, and a lack of a jovial tone keeps it from the former. Instead, Ocean’s Eight is, if you will, a Boo Radley to the Ocean’s trilogy. It’s there, it does its job, but its restrained nature keeps it from fully integrating.